One of the famous card games in the past is the euchre, a trick-taking card game where the player must have the highest trump Score Cards in order to win the game. 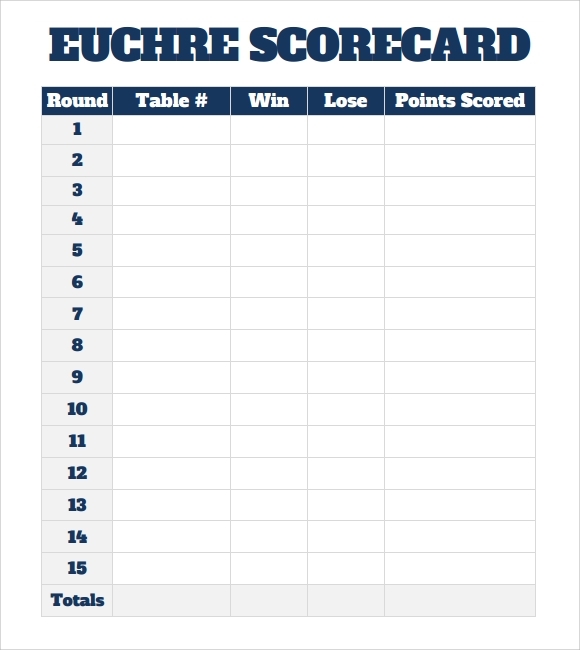 Euchre score sheet will do the task of counting the scores of a player in the game; this recording tool will serve as the official document to know who really won the match. The example template is downloadable for free in the internet; a sample format is free to have when you need one, you can also look at it at Microsoft word or excel for printing of the scoresheet. 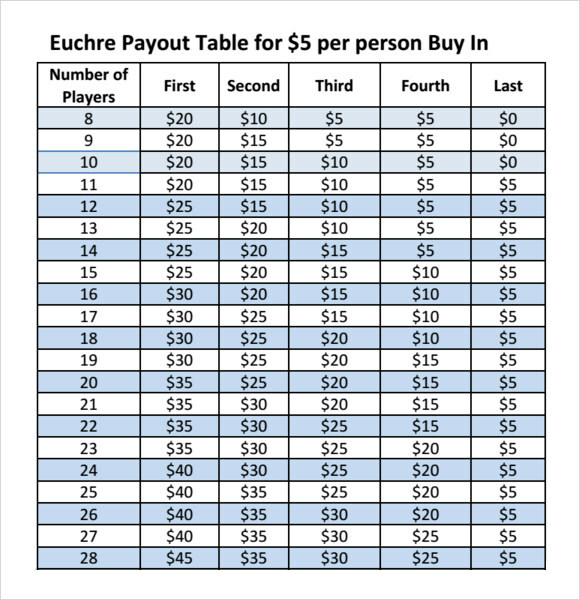 Euchre score sheet will guide the dealer and player if they are in the right track of the game or if a player already has the highest trump card to win a competition. You may like Project Scorecard Templates. Traditionally, euchre used to be played by 2 to 4 players. Today, even 8 players can enjoy this game together. But keeping the scores of 8 players is not easy. 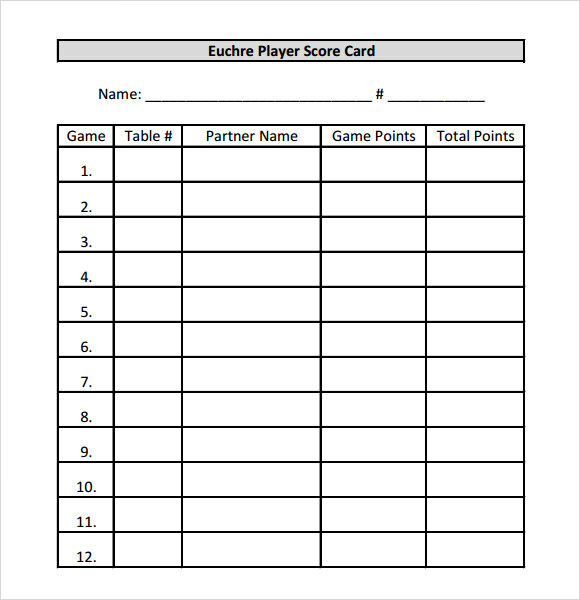 So, make it easy by using an 8 Person Euchre Score Card Template. Progressive euchre is played a little differently. And therefore, there are separate scorecards for this game. This particular Progressive Euchre Score Card Template can be adopted if you want economy of money as well as time. Its design is catchy and the content lucid. 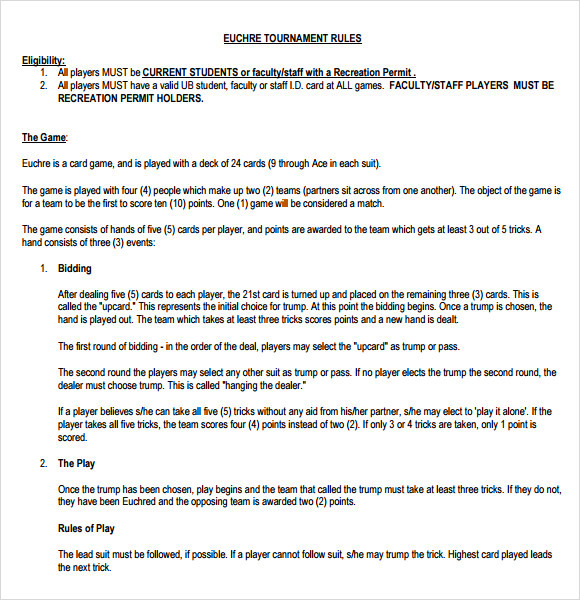 This Euchre Tournament Rules Template comes with some basic rules for playing the game. If you haven’t played euchre before, then this template will help you immensely. Opt for it and make your friends and family members familiar with the norms of the game. Interestingly, euchre is a game that can be played by 12 persons at a time. But keeping records of the scores of 12 persons is not a matter of lark. Hence, using a 12 Person Euchre Score Card Template can be of help. Euchre is a card game, originated by the folks of North America. The lowest number of players which can participate in this game is two. Newer versions involve more players. In essence, it’s a trick-taking game played with a deck of 24, 25, or occasionally 32 cards. You may also like Phase 10 Score Sheet Templates. Who is a Good Euchre Player? To be a good euchre player, you need three qualities. The first quality is communication. You must have good communication skills to be a Euchre winner. The second quality is memory. Memory weak? Simply back out of the game! Thirdly, it’s the ability to employ tactics. How are euchre Score Card Templates Helpful? In euchre, players need to settle scores, and that is why having a score card at hand is important. Although, you can create your own score card, it will consume a lot of time. 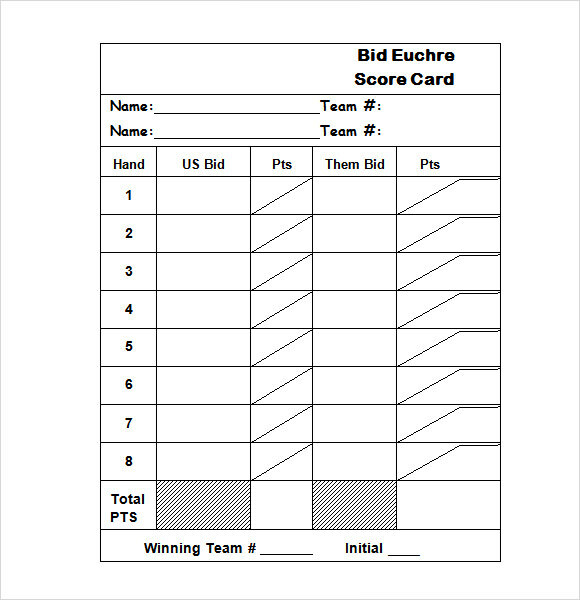 For convenience, you can use euchre score card templates. You can also see Hockey Score Sheet Templates. 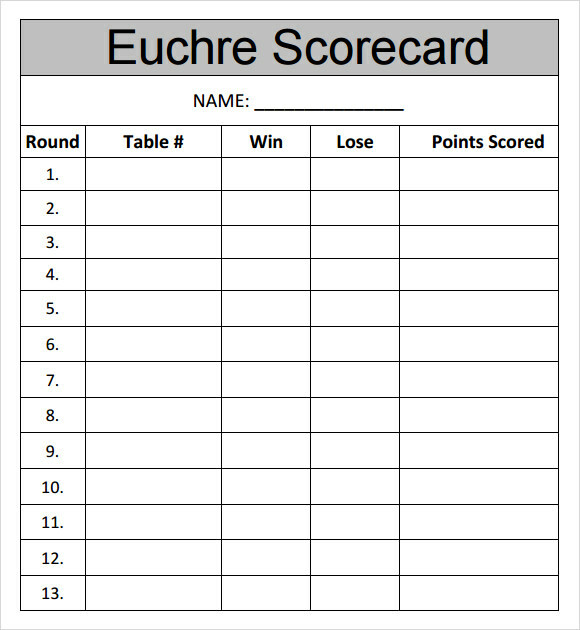 Where to find Euchre Score Card Templates? These templates are readily available over the internet. The good news is that there is no shortage of variety; you can get as many different designs, colors and sizes as you want. However, you must see to it that the source of templates is reliable.